Thanks for getting in touch. You are quite correct, I am far too young to have grandchildren. I think you might have been somewhat mislead in your comment that Germany generates 60% of its energy, and Denmark generates more energy than it needs, from renewable sources. Looking at the annual review of world energy statistics (p 41), Germany gets 9% of it's total energy consumption from renewables, while Denmark gets 18%. Clearly, there is still some way to go before we are producing all of our energy from renewables. Indeed, I think that James Hansen, probably the leading expert in climate change, one of the first scientists to realise the threat it posed, put it well when he said in an essay in 2011: "suggesting that renewables will let us phase rapidly off fossil fuels in the US, China or India, or the world as a whole, is almost the equivalent of believing in the Easter Bunny and Tooth Fairy". 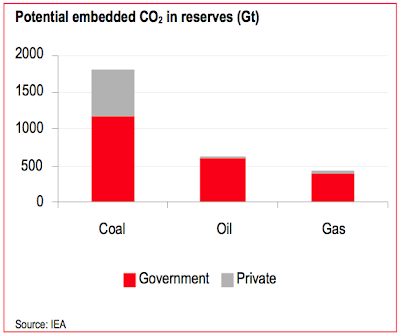 These figures make clear that the biggest problem is coal, and especially coal being burned in China. Any 'environmental' policy that does not address this is, to my mind, not an environmental policy. Natural gas, when burned, produces twice as much energy per unit of CO2 as does coal (i.e., coal produces twice as much CO2 per unit energy). If we accept that we have an upper limit to the amount of CO2 we can produce, then it makes sense to use the fuel that gives us as much energy as possible for that given amount of CO2. For example, if increased natural gas abundance leads China to switch from a coal-dominated to a gas-dominated power sector, it would cut that big purple column on the left hand side above in half. That would be a much bigger impact that wiping the UK's emissions off the map completely. So while full renewables penetration would be the ideal situation, we should not let perfect stand in the way of good, because switching natural gas for coal wherever possible would produce significant impacts. 'Natural gas and renewables complement each other very nicely,' Rhone Resch, CEO of the Solar Energy Industries Association, said this morning at a press conference for the release of Bloomberg New Energy Finance’s 2013 Factbook, an exhaustive analysis of the state of clean energy in America. "Shale gas at low cost can help to create a hybrid system, whereby more gas-fired power is fed to the grid, supplanting coal, and augmented by wind and solar." I have a blog post describing this in more detail here. It's a little known fact that of all the US states, Texas has deployed more wind energy than any other in the last 10 years. That's big, bad Texas, home of the shale gas revolution. The abundance of cheap natural gas is making renewables more attractive. Equally, the improved economic conditions, part fuelled by the shale developments, leaves more money in state finances to fund renewable developments. Contrast that with the situation in the UK - rising energy costs mean that the additional charges needed to promote renewable development are becoming increasingly politically unpopular, while the poor economic situation in which our government is stuck means that there is little government cash to fund this. My take on the situation is as follows: Firstly, the development of UK shale gas should not be seen as a panacea for all our energy and economic problems. It will help, but it's not a solution to all our problems (I know that some in the media have presented it as such). However, even the most optimistic predictions for renewables development show that we will be burning gas in this country for some time to come. Remember, only 1/3 of the gas use in this country is used for electricity, another 1/3 is used for domestic heating and cooking, and the final 1/3 is used as feedstock in industrial processes (such as at the Grangemouth plant that was nearly forced to close 2 weeks ago, in part because of the increased costs of raw materials). At present, we are increasingly importing this gas from abroad. This is money lost to the UK economy, to be spend by Qataris on fast cars and an air conditioned football world cup. Given that a potential equivalent resource exists within the UK, it seems irresponsible to be allowing this money to leave our economy when we could be developing a home-grown alternative instead. However, it is important that this opportunity is leveraged to our advantage, unlike our past development of North Sea oil and gas. I would like to see the government ring-fence the taxes taken from future UK shale developments, to be spent only on energy efficiency initiatives and/or research into improving renewable energy technologies. I have already written to various MPs to make this suggestion (see also my blog post on this aspect). I hope this goes some way to answering your questions. I realise that I've sent quite a long reply, but I think it is a subject worthy of lengthy discussion, rather than the 30 second soundbites provided by the media. Another interesting article, keep up the good work. Glad I found this blog. It seems like a good place to keep myself informed on fracking issues. Thank you.